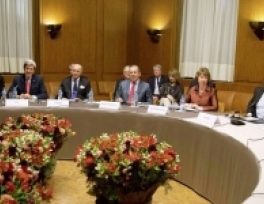 Iran and six world powers reached a breakthrough agreement in Geneva to curb Tehran's atomic ambitions in exchange for limited sanctions relief, in a first step towards resolving a dangerous decade-old standoff. 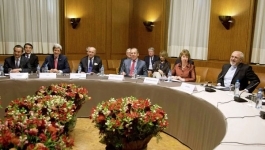 The deal between Iran and the United States, France, Germany, Britain, China and Russia was nailed down early on Sunday after more than four days of negotiations. President Barack Obama says a nuclear deal with Iran is an "important first step" toward addressing the world's concerns over the Islamic republic's disputed nuclear program. Obama says the deal includes "substantial limitations'' on Iran and cuts off the Iran's most likely path to a bomb. US Secretary of State, John Kerry, said the deal does not recognize Iran's right to enrich uranium. Speaking after the deal was struck, Kerry said the nuclear deal makes Israel and other US allies in the Middle East safer. Tehran will halt progress on enrichment capacity and stop advancing on the heavy water reactor at Arak, in return there will unprecedented transparency and open access to international weapons inspection. The Iranian Foreign Minister Mohammad Javad Zarif said, "I hope we can start restoring the lost confidence. The Iranian people demand respect for their rights and dignity, it is important to restore their confidence and I hope this process can do that." European Union foreign policy chief Catherine Ashton said "I'm delighted that we have got there, we are confident for a long term deal, this is the first step as you will see its very much within the framework of reaching a comprehensive agreement." The talks were aimed at finding a package of confidence-building steps to ease decades of tensions and banish the specter of a Middle East war over Tehran's nuclear aspirations. The Western powers' goal had been to cap Iran's nuclear energy program, which has a history of evading UN inspections and investigations, to remove any risk of Tehran covertly refining uranium to a level suitable for bombs. Tehran denies it would ever "weaponize" enrichment. The draft deal that had been under discussion in Geneva would see Iran suspend its higher-grade uranium enrichment in exchange for the release of billions of dollars in Iranian funds frozen in foreign bank accounts, and renewed trade in precious metals, petrochemicals and aircraft parts. Iran will get access to $4.2 bn in foreign exchange as part of the agreement, a Western diplomat said on Sunday. Refined uranium can be used to fuel nuclear power plants - Iran's stated goal - but also provide the fissile core of an atomic bomb if refined much further. Diplomacy was stepped up after the landslide election of Hassan Rouhani, a relative moderate, as Iranian president in June, replacing bellicose nationalist Mahmoud Ahmadinejad. Rouhani aims to mend fences with big powers and get sanctions lifted. He obtained crucial public backing from Supreme Leader Ayatollah Ali Khamenei, keeping powerful hardline critics at bay. By reducing the chance of military action against Iran and raising the prospect of more sanctions relief in future, the Geneva pact may stem capital flight from the country and encourage a partial recovery of domestic investment. The rial plunged to near 40,000 against the dollar late last year because of the sanctions, losing about two-thirds of its value over 18 months. It then recovered some of its losses and stabilised near 30,000 after the election in June this year of Iranian President Hassan Rouhani. Despite the rial's surge on Sunday, traders said it was not clear that any extended period of appreciation was starting, since the government felt excessive currency strength could hurt exports and complicate state finances. Aflani predicted authorities would intervene in the market if needed to prevent the rate from moving too far from 29,500.